Watching paint dry doesn't rank high on the list of "Best Ways to Spend a Friday Night in Phnom Penh". But what if the painters are six internationally renowned graffiti artists? 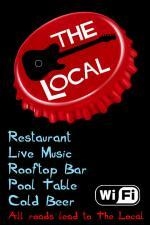 Let's up the ante and throw in live music, both international and local, modern and traditional. Devotees of Metro, the uber-hip riverfront restaurant, have been awaiting the opening of the "new Metro" for months. The grand opening was Saturday, July 16, with a private party from 6 to 10 pm for 75 and their plus-ones. Then the doors officially opened. For the record, though, the name is Rahu. All the way from Philadelphia in the US of A, DJ Ca$h Money rinsed Riverhouse Cambodia this weekend, but Who is Cash Money? DJ Cash Money (born Jerome Hewlett) is a Philadelphia-based American turntablist, hip-hop artist, and record producer. He was the first inductee into the DJ Hall of Fame. The area around the Russian Market has long been in need of a good watering hole. With a large ex-pat community living in the vicinity, it’s a wonder why there are few bars around for those not wanting to make the trek to the riverside. However we need wait no longer. The Local is the latest venture by seasoned bar owner Kamala Hood and boasts one of the best locations in this area of town. Perfectly situated on street 454, just around the corner from the market it’s a great place to stop by for a beer or something to eat.